Termed “Exceptional” by AECBytes, 4M brings proven BIM Suite to AutoCAD® users seeking far more affordable, easier transition to BIM than Revit®. The 4M suite, with IDEA Architecture as its center, is the only 3D BIM suite built upon native DWG Â technologies. It offers an exceptionally easy 3D BIM for the complete building design flow — from conceptual design of building models, structural analysis, through MEP building services including Mechanical/HVAC, Electrical, and Plumbing, Water and Sewer to construction-ready 2D DWG drawings. For contractors: IDEA Architecture to produce, prepare, and maintain construction-ready output, including full sets of DWG drawings and bills of materials (BOMs). 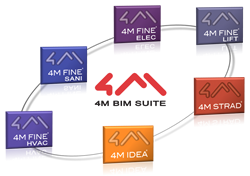 The 4M suite, with IDEA Architecture as its center, is the only 3D BIM suite built upon native DWG and 4MCADÂ® technologies. It offers an exceptionally easy 3D BIM for the complete building design flow — from conceptual design of building models, structural analysis, through MEP building services including Mechanical/HVAC, Electrical, and Plumbing, Water and Sewer to construction-ready 2D DWG drawings.